Asteroid Itokawa takes center stage in this photo from the Japan Aerospace Exploration Agency's Hayabusa spacecraft taken in October 2005. An analysis of samples collected by Hayabusa have revealed the origins of Itokawa, scientists say. Even as Japan's Hayabusa2 mission prepares to place landers on the surface of an asteroid, scientists are still squeezing discoveries out of data and samples gathered by its predecessor. 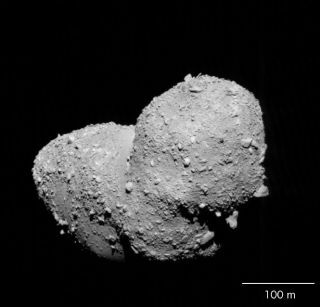 Now, those samples have allowed scientists to piece together a detailed history of the asteroid that the first Hayabusa mission visited, a rocky near-Earth asteroid called Itokawa. The analysis suggests that Itokawa was born from a larger body that formed 4.6 billion years ago. Then, about 1.5 billion years ago, a large collision tore that body apart and some of the remnants eventually stuck together to form Itokawa. But all of that happened out in the asteroid belt: Itokawa was kicked out toward Earth only between 100,000 and 400,000 years ago. And because objects don't tend to survive long in orbits like the one it currently holds, the team estimates that within another million years, it will either fall apart or run into Earth. A sample of the Itokawa asteroid brought back to Earth by the Hayabusa spacecraft. The phosphate minerals marked in the image helped scientists better understand the asteroid's history. As welcome as the new research will be to scientists looking to understand the rocky bodies near Earth, it very nearly wasn't possible. The Hayabusa spacecraft experienced several challenges on its journey. Shortly after its launch in 2003, it was damaged by a large solar flare. It hobbled off to its target, struggled to land, and unsuccessfully deployed a lander. Then, the spacecraft couldn't manage to shoot a probe into the surface to grab large samples to bring home, managing to collect nothing larger than dust. But it turns out that in the context of the new research, that last failure may have been just as well. The authors write that the sample they studied "is so fragile that it may not have been collected if the Hayabusa spacecraft sampling mechanism had operated as planned and its impactors struck the Itokawa surface." Despite, or perhaps because of, Hayabusa's rocky mission history, the Japanese space agency was eager to revisit the idea of an asteroid sampling mission. Hayabusa2, the successor mission, is currently orbiting less than 0.6 miles (1 kilometer) above an asteroid called Ryugu, scouting out locations to deposit landers and gather samples to bring back to Earth. The new Hayabusa research is described in a paper that was published Aug. 7 in the journal Scientific Reports.